THE TUMULTUOUS life and times of Michael Collins is recreated in Declan Gorman’s gripping new play, The Big Fellow, based on Frank O’Connor’s classic 1937 biography, and which comes to the Town Hall Theatre this month. The Big Fellow presents the compelling story of Collins’s rise from unknown volunteer in the GPO in 1916, to leader in the War of Independence, and untimately, his death in the Civil War. More than a dramatisation of the life of Collins, however, Gorman’s play is also the story of Frank O’Connor. As ‘the Big Fellow’ is conjured to vivid life by the writer, the epic tale of the birth of a nation is re-lived by both men: the one who survived and saw the disappointment that followed the dream, and the tragic hero who died in trying to secure the Treaty. Speaking ahead of the play’s Galway visit, Gorman reveals how it was the book, rather than Collins, which first drew him. “Collins hadn’t attracted me as a subject for a play until I read Frank O’Connor’s book," he says. "It’s brilliantly written, it’s very eloquent, and at times very elegiac. I don’t think any other iconic historical figure has had such a vivid psychological portrait done of them. O’Connor diverted from a glittering literary career to spend two years writing The Big Fellow. As a literary writer taking on the biography, which O’Connor described as a labour of love, it gives the book a very special place in the canon of biographies in the world I believe. Many people’s image of Collins will be influenced by Neil Jordan’s epic movie starring Liam Neeson. Does the play offer a different slant on his story? “Neeson’s performance as Collins is remarkable and, interestingly, he used O’Connor’s book as his main reference point,” Gorman replies. “There are aspects that we go into in the play that aren’t touched on in the movie at all. 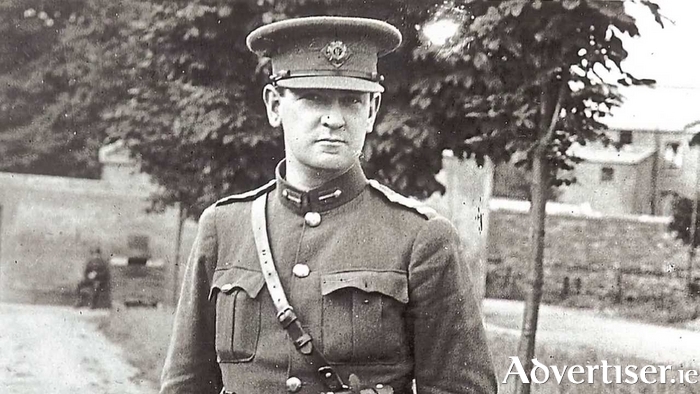 We look at Collins’s relationship with his aide de camp Joe O’Reilly. They were together constantly from Frongoch in 1918 up to the day of Collins’s death. "Collins had a domineering relationship with him, he bullied him, abused him, he sent him out on all kinds of missions that no young man should have been sent on. That is a very difficult part of the play as it shows a negative side of Collins. He could be petulant and bullying which makes it all the more extraordinary that he could switch to become generous and charming. "That’s another thing that attracted me to the book, they’re not figures carved in alabaster. O’Connor wanted to show Collins as a human being; he took a drink, he swore, he lost his temper, he cheated at cards, there were all those sides to him that weren’t shown in the movie. There’s also stuff in the movie that we don’t go into; for instance O’Connor barely mentions Collins’s relationships with women whereas the movie makes a big deal of his involvement with Kitty Kiernan. A key relationship in the movie is that between Collins and Harry Boland and again that’s not a huge part of the book. Gorman also directs the play, for Co-Motion Media, which features just two actors, with Cillian Ó Gairbhí as Collins and Gerard Adlum as Frank O’Connor and others. “As O’Connor [pictured above] begins to write and imagines these other figures he gets up and re-enacts the story with Collins and assumes all the other parts,” Gorman explains. “I was very lucky to get Gerard, he is extraordinary. I have never seen a performance quite like it in his portraying the multiple parts, O’Reilly, Brugha, Eamon de Valera, Thomas Clarke. Cillian and Gerard are a great team and they’re very funny as well.